The year is 1920, and Bostonians from all walks of life- rich and poor, young and old, blue collar and white collar- are being enticed to invest their life savings with a friendly, charismatic Italian-American by the name of Charles Ponzi. Some are well meaning, while others are simply greedy. Little do they know that he is neither a financial wizard nor a boldly innovative thinker, but a grandiose fraudster and clever con artist who has kept under wraps a Canadian prison record for bank fraud- and who now seeks to make his obsessive dream of amassing great wealth come true at the huge expense of thousands of innocent people. Ponzi's incredible persuasive power to dupe foolish investors quickly extends beyond the city borders, and the overall fiscal health of the entire Commonwealth is soon under close scrutiny by Governor Calvin Coolidge, who entrusts Massachusetts Bank Commissioner Joseph C. Allen to investigate. When Allen seizes five banks and prevents Ponzi from accessing his stolen millions, the swindler's fate hangs in the balance. However, the full brunt of public wrath comes to bear on Allen and his wife, Hart-Lester Harris Allen- and even worse, their happy future together becomes highly questionable when a mob contract is put out on his life. 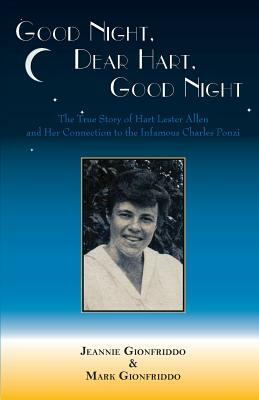 As told through the eyes of Hart-Lester, Good Night, Dear Hart, Good Night opens with her idealistic, romantic adventures as a wealthy young college graduate; her marriage to Allen and their early trials and tribulations; and how Hart and Joe's paths unfortunately cross with the cunning Ponzi, whose own rise to power and rapid descent unfolds in alternating chapters. The book, written in narrative non-fiction style, is based on the author's interviews with Hart-Lester, other eyewitness accounts and associated correspondence, and newspaper and journal articles from this turbulent time in Boston's history. It offers a fascinating look at a bygone era as well as an examination of Ponzi, the smooth talking criminal and inventor of the first 'get-rich-quick' scheme that to this day continues to be reinvented (Bernard Madoff in 2009).